This may look like just a badge in a silly game, and that’s what it is. 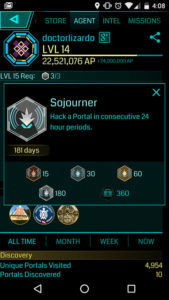 The “Sojourner” platinum badge in Ingress, for hacking a portal once per day over continuous days without interruption. Within 24 hours I have to get to a place in real world geography, where there is an Ingress “portal”, a game location you can only affect if you are within 50 meters of it by geolocation services. For me that means I go one block away from my house, in either direction, either up the hill to the Good Prospect Community Garden, or to the corner on Mission to “No Temas, El Señor Está Contigo” which is a mural on the front of a tiny local storefront church. So to me, my Sojourner badge for hacking a portal every day for 180 days, is also a beautiful marker that I have been mobile and healthy enough to leave the house every single day for the last six months. I’ve been looking forward to this milestone! If I “failed”, it is okay, it means I was very ill, or not physically able to get up and down the stairs, and that happens and it’s not always under my control. (And that will happen again, I’m not getting any younger. ) Some days, it has been a case of “OMG, it’s raining, and cold, and I don’t feel well, but…. I could still make it to the corner and back on my scooter”. The badge motivated me that little bit. It feels like a nice moment of celebration anyway, I am happy that I’m at this level of ability and mobility. It also take confidence to leave the house by myself when I am at low points. 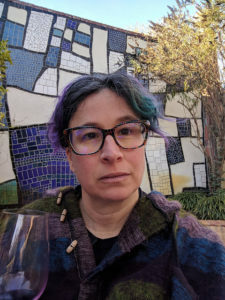 I talked over the idea of “leaving the house every day” as a measure of quality of life for myself, last year with my super nice therapist who works with people with chronic pain and disability. I feel satisfied with myself and proud. The Fitbit’s data tracking was useful and I may try using it again, as it was good to just show a doctor or physical therapist how my usual levels of activity changed, in a crisis. Without that kind of information they may not understand that “using a wheelchair” is not just one state of being and how much varying levels of mobility can impact a person’s life. I like the style of the Sojourner badge a lot as a positive and achievable measure for myself over a long period of time. Maybe I can make it to a year for the Onyx badge?! Categories disability1 Comment on Six month celebration: Sojourner!